Just when you were getting your head around rising interest rates and the cost of filling up comes the threat of higher prices on everything from soup to (puréed) nuts. Courtesy of a trade war in the wake of the Trump administration’s steel and aluminum tariffs, and warnings of more to come. This is not to suggest that the Trudeau government’s promised retaliation is wrong, only that you’ll pay for it when Canadian tariffs come into effect in July. “A fair cross-section of prices in Canada are about to move higher,” warned Derek Holt, Bank of Nova Scotia’s head of capital markets economics. “Some prices may begin to move higher sooner than the July imposition if purchases are brought forward ahead of the tariffs and retailers take advantage while some prices may increase well after the tariff increases once, say, current model year inventories push through,” he added. The Trump administration slapped 25-per-cent tariffs on steel and a 10-per-cent levy on aluminum. Canada immediately responded with countermeasures affecting up to $16.6-billion of U.S. imports including steel, aluminum and other goods. Ottawa’s measures run from 10 per cent on a variety of products to 25 per cent on steel. As The Globe and Mail’s David Parkinson reports, Bank of Montreal estimates inflation would rise by 0.1 to 0.2 of a percentage point. Of course, how you’re affected depends on how much of which American products you buy. I suspect there’s not widespread demand for bobbins, but toilet paper and coffee are another thing. (Unless you drink decaf, which isn’t being hit.) Soup, too, though I’m not sure how many of us consume puréed nuts or nut pastes. Besides the tariffs related to steel and aluminum, here’s an slimmed-down list of affected products. The complete list is here. Big-ticket items of iron or steel, such as stoves and fridges. “For some of the bigger-ticket and more affected categories, look for a possible rush to buy in June ahead of the tariffs in July,” said Scotiabank’s Mr. Holt. “The government of Canada has given consumers a mild adjustment period to make their purchases now, which helps limit the negative impact while nevertheless possibly adding to sales volatility over the summer months,” he added. What happens next could be even more important, with the U.S. tariffs also hitting Mexico and Europe, Dana M. Peterson and Ebrahim Rahbari warned in a report. “The relatively small dollar value of the U.S. tariffs and the retaliatory measures levied by targeted economies suggest limited direct growth or inflation effects,” they said. Steven Chase, Adrian Morrow, Greg Keenan: Trade war brews as Ottawa plans levies against U.S.
“The USD has started the week on the back foot despite the overhang of potential trade wars with an impasse in trade talks over the weekend,” said Sue Trinh, Royal Bank of Canada’s head of Asia foreign exchange strategy in Hong Kong, referring to the U.S. dollar by its symbol. With apologies to playwrights Jerome Lawrence and Robert E. Lee, Bay Street, businesses, rich folks and rating agencies are anxiously waiting to see which of Ontario’s political leaders will inherit the Wynne. 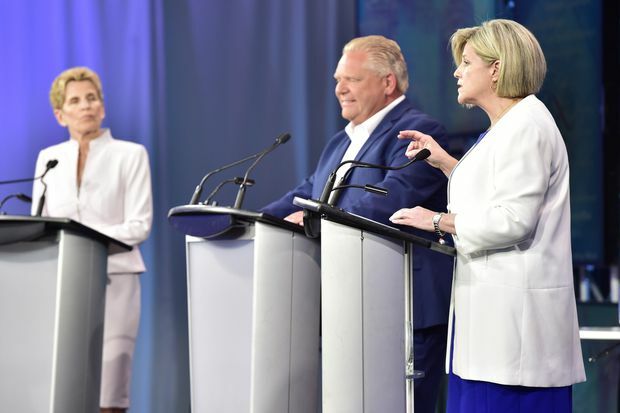 By her own admission, Liberal Leader Kathleen Wynne is headed for a loss in Thursday’s election to New Democratic Party rival Andrea Horwath or Conservative challenger Doug Ford, who would inherit a big provincial economy at something of a crossroads. Even if she’s wrong and the Liberals were to prevail, she would inherit her own hefty pre-election promises. This comes as Ontario’s fortunes slide, though hardly into a mess, with credit-rating agencies already warning the province is on thin ice. “The NDP looks to ramp up spending above and beyond current Liberal pledges, with the extra paid for by a 1.5-percentage-point hike in the corporate income tax rate and a one- to two-percentage-point personal rate hike on (relatively) high-income earners,” Mr. Porter said. “In complete contrast, the Progressive Conservatives look to trim corporate rates by one percentage point and to slice middle-income tax rates,” Mr. Porter added. If she could still somehow emerge a winner, Ms. Wynne, of course, would inherit her own hefty pre-election promises, which have already raised the eyebrows of rating agencies. Ontario’s economy has enjoyed a strong run, but that’s poised to downshift. Growth in gross domestic product was 2.8 per cent in 2017, but the Conference Board of Canada, in its latest outlook, projected about 2 per cent or slightly more for the next several years. “Rising interest rates and new policies for homebuyers have weakened the housing sector and slowed the pace of employment, income, and consumption growth,” the group said in a report put together by director Marie-Christine Bernard. Ontario, too, has a lot at stake as trade with the United States escalates from uncertainty to war, given its large manufacturing base. Canadian, U.S. and Mexican negotiators have been struggling to remake the North American free-trade agreement without success. And just last week, the Trump administration hit Canada with tariffs on imported steel and aluminum, which will be felt most in Ontario and Quebec. “Despite higher growth in the U.S. economy and the competitive value of the loonie, export growth will remain weak over the near term, although it will pick up to 2.4 per cent in 2019 after a minuscule gain of 0.1 per cent in 2018,” Ms. Bernard’s report said of Ontario. And, of course, all bets are off if NAFTA collapses or Ontario’s key auto industry takes a hit. On the fiscal front, Ontario finally projected a 2017-18 surplus after a long run of deficits. Then came the run-up to the election. After the previous Liberal budget, Moody’s Investors Services changed its outlook on Ontario’s ratings to “negative” from “stable,” warning about spending and debt. We’ll see what the agency has to say about the fiscal program of whoever takes Thursday’s election. As for jobs, the Conference Board projects unemployment down to 5.8 per cent this year, and back up to 6 per cent next year. The latest Statistics Canada measure put it at 5.8 per cent in April. Apple Inc. holds its global developers conference in San Jose. Otherwise, it’s a slow start to a hectic week, with a report economists expect to show a 0.5-per-cent dip in U.S. factory orders in April. Markets will be watching for the latest Jobs Openings and Labour Turnover Survey from the U.S. Bureau of Labour Statistics and quarterly results from Hudson’s Bay Co. Observers also expect Statscan to report a decline in labour productivity of 0.1 per cent for the first quarter. A key day, this, given the trade war. On the home front, economists project Statscan’s April trade report will show a slimmer deficit. “Canada’s trade deficit is expected to narrow significantly to $2.5-billion in April from the prior month’s record $4.1-billion shortfall,” said Benjamin Reitzes, BMO’s Canadian rates and macro strategist, noting the impact of stronger oil prices as the second quarter kicked off. Where the enemy in this battle is concerned, the Trump administration could get more ammunition if, as economists forecast, the government report shows the trade gap rising to US$50-billion in April from US$49-billion in March. Overseas, most observers expect India’s central bank to hold interest rates steady. “But the hawkish tone of the previous meeting’s policy minutes, and the deterioration in the inflation picture since then, suggest to us that policy is likely to be tightened,” Shilan Shah of Capital Economics said. With housing markets and household debt in the spotlight, the Bank of Canada’s semi-annual look at the financial system will be interesting, to say the least, particularly given that the latest numbers show consumers – finally – easing up on the pace of borrowing. Bank of Canada Governor Stephen Poloz, who held his benchmark overnight rate steady last week but signalled an increase as early as July, will follow that up with a news conference. “Governor Poloz’s press conference will focus on the release of the Financial System Review; however, he could be quizzed on monetary policy in the Q&A, particularly regarding how steel and aluminum tariffs impact his recent more bullish tone,” said Andrew Grantham of CIBC World Markets. The Group of Seven summit in Charlevoix, Que., should be a raucous affair given that U.S. President Donald Trump has ticked off just about everybody he can. “The upcoming G7 meeting is likely to be one of those ‘fly on the wall’ meetings that could see a lot of plain speaking take place in the wake of President Trump’s decision to implement the promised tariffs on steel and aluminum,” CMC Markets chief analyst Michael Hewson said. “Is Trump’s assertiveness part of a wider strategy to show he is even handed with both friend and foe, before walking things back [this] week, or are we really looking at a full-blown trade war?” he added. China will help set the stage before the summit starts with its latest trade report, which comes amid a trade tussle between Washington and Beijing. CMC’s Mr. Hewson believes both exports and imports perked up in April. “This suggests that after a slow start and maybe some disruption as a result of Chinese New Year that economic activity is normalizing,” he said. At home, it’s oft a pointless exercise to try to predict what Statscan’s monthly jobs report will show, given the volatility, but economists always make a valiant effort, nonetheless. They expect the May report to show net job gains of between 8,000 and 25,000, with unemployment steady at 5.8 per cent. “Hiring over the second quarter should bring 2018 job creation back into positive territory,” CIBC’s Royce Mendes said.